Porko Puerco loved to eat salad for dinner, and he loved to put a lot of fruit and unusual vegetables in it. Today, he was going to put apple, peach, strawberries and heart of palm over his favorite red leaf lettuce. Yummy. 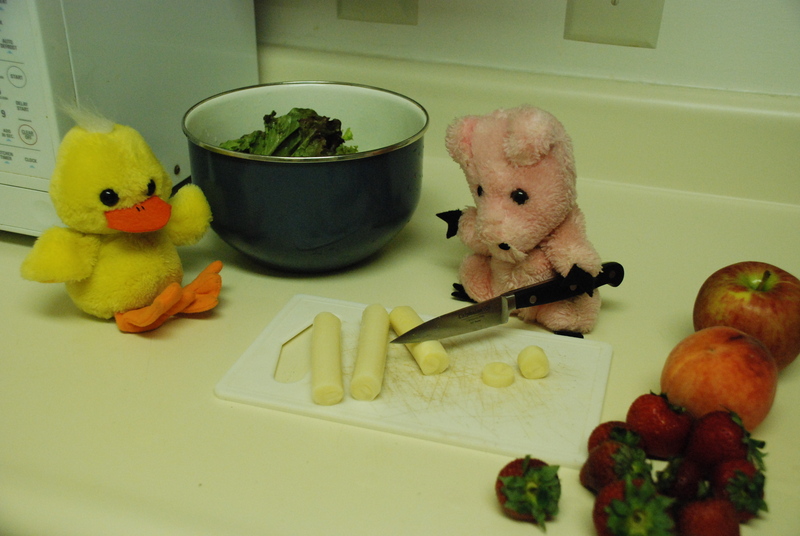 Quack also loved when Porko made salad for dinner, although he hated to help, which was a behavior that Porko decidedly did not love. “When am I going to get grandchildren from you? When are you going to have kids? Am I going to die before you make me happy?” God, that was all Quack kept hearing from his mother these days. He just didn’t have the desire to procreate like everyone else did. Babysitting for the neighbors, he could admit that these little guys were cute at the moment, but it wouldn’t be long before they turned into eating, crying, pooping machines. No thank you, Mom. The old hen would just have to hope his sister would pop out a couple of eggs soon. 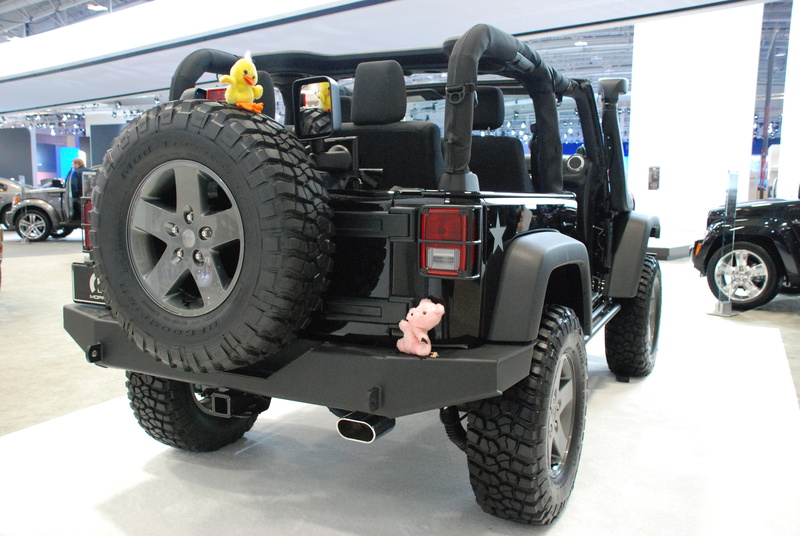 This was hardly what Porko Puerco had in mind when Quack suggested they try new hobbies together. Still, he had heard somewhere that the key to any good relationship was to be good, giving, and game for anything, so he supposed he couldn’t really say no until he tried it. Was there a salesperson around here anywhere? He was definitely going to need a smaller size. 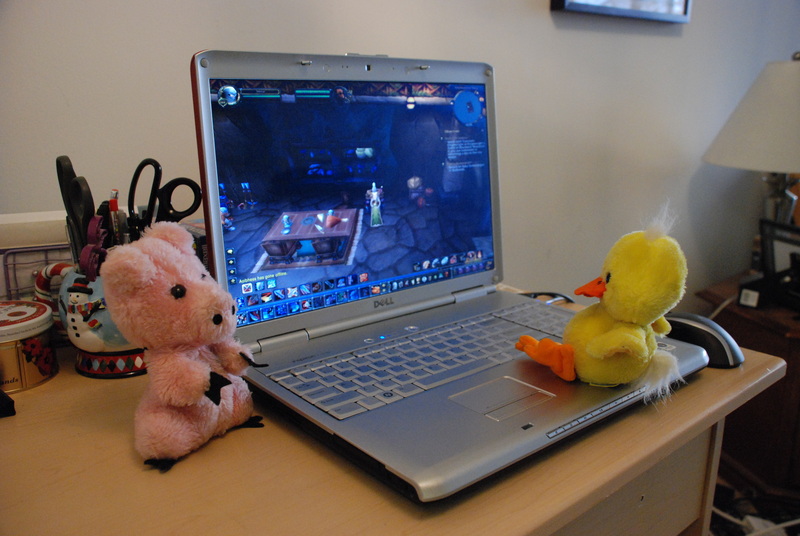 It was only a couple months ago that Quack had started playing World of Warcraft. On the one hand, Porko Puerco thought that it was $12.99 well spent, since Quack came home every night to get on the computer instead of going out and spending money at the pub. On the other hand, well, Quack came home every night and got on the computer, and he didn’t do much else. Sure, money was saved, but at the expense of his social life. Porko wanted to get his friend back, and he was probably going to have to sabotage his own computer to do it. Ok, fine, so technically there were only four members to a team, but Tim and the others were convinced that that other team (who called themselves “Doctor Google,” the cocky bastards) were also cheating. Porko Puerco and Kevin had both seen the other team’s members using their cell phones in the middle of the quiz, which was strictly forbidden. 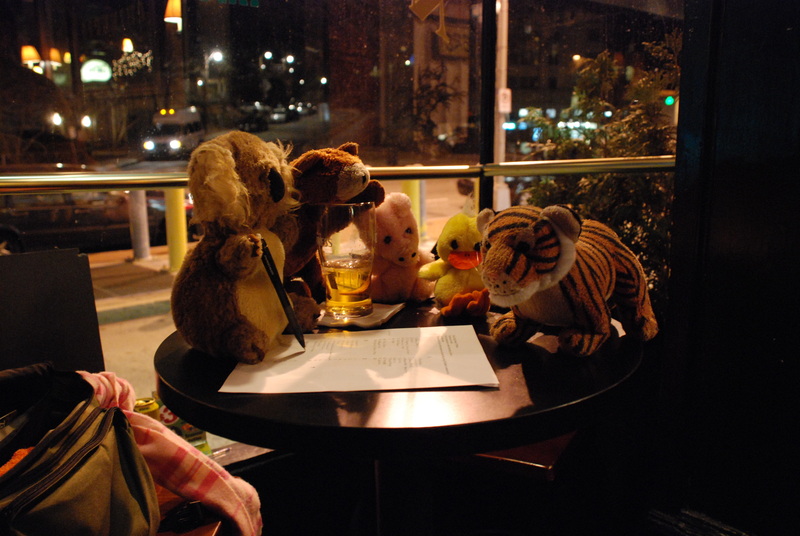 Plus, one of Doctor Google’s members was good friends with the bartender, who wrote the questions every week, and Tim was pretty sure that they were getting answers ahead of time. If it so happened that Tim and the other members of Team Fuzzypants ever won the quiz, well, they’d deal with the consequences of having five members then. Until that day, though, they would just drink their pints and try to expose Doctor Google’s cheating ways. 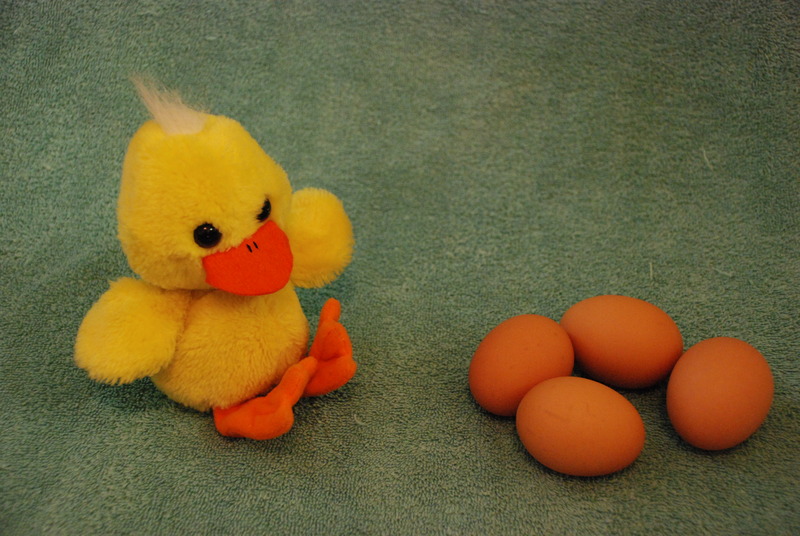 Quack’s parents had given him Risk for Christmas a couple years ago, but Porko Puerco kept refusing to play with him. Finally, after months of begging, Porko agreed to give the game a try. 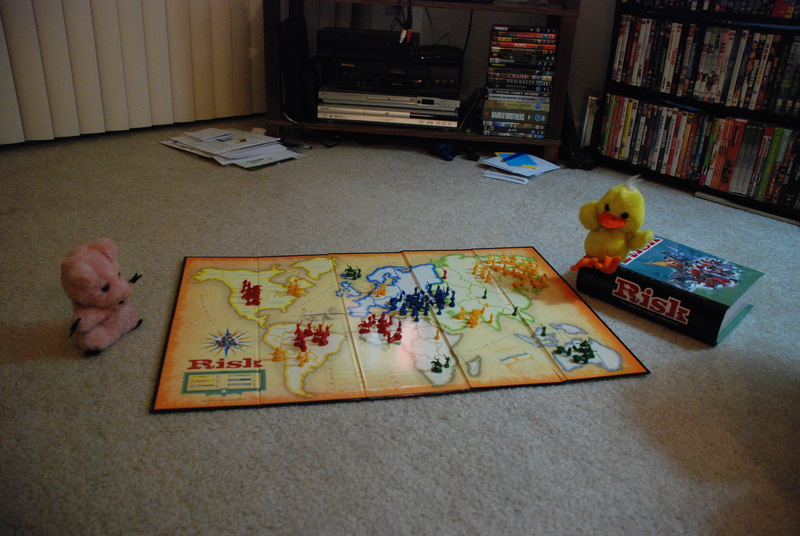 It would be the first and last time he would play Risk. He was going crazy. This game took forever. With thanks to Stephen Pastis, who is the greatest comic artist ever (since Gary Larson and Bill Watterson retired).